1. Mix herbs with cream cheese by hand until blended. 2. Spread mixture over your favorite crackers. 3. 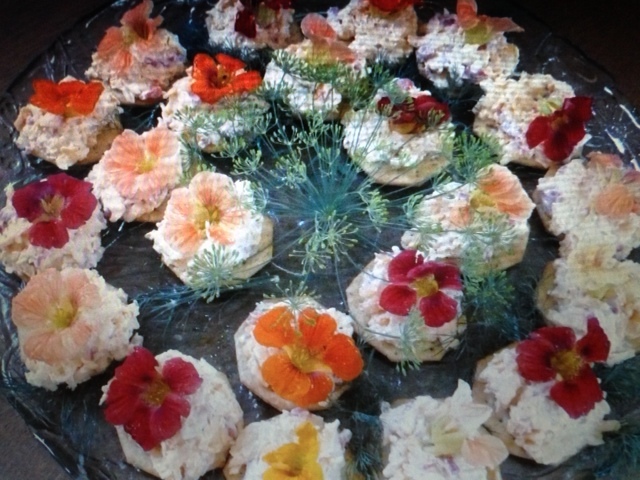 Garnish each cracker with a nasturtium blossom. Alternately: Core a zucchini. Fill center with cream cheese mixture. Slice and serve on a cracker. Garnish with a nasturtium blossom. This recipe is the perfect compliment to chilled summer salmon, or any fish, fresh off the grill. Also makes a great spread for tea sandwiches, or any sandwich needing some zip. Combine all ingredients. Keep chilled until ready to use. Posted in Herbs To Grow In Dallas, Recipe and tagged garden recipe, Herbs to Grow and Use in Dallas, Nasturtiums. Bookmark the permalink.